Nicholas Sparks is the author of 15 books. He lives in North Carolina with his wife and children. You can visit the author’s web site at www. nicholassparks.com. NCM® Fathom Events and Relativity Media are presenting “A Night with Nicholas Sparks’ Safe Haven: Filmmakers, Author and Stars Bring the Book to Life.” This one-night event will feature a live discussion and Q&A with Nicholas Sparks, appearances by Oscar®-nominated director Lasse Hallström and stars Josh Duhamel and Julianne Hough, and exclusive clips and behind-the-scenes footage of the much anticipated film. This giveaway is sponsored by the publisher and TWO BOOKS are available. I totally love Nicholas Sparks’ books!! 🙂 Thanks for the giveaway! Thank you for the giveway 🙂 Hope everyone has a good new year. Thanks for the giveaway. This book sounds intriguing. Can’t wait to read it. I love Nicholas Sparks books. This is a great giveaway. Thanks fir the opportunity. Happy New Year everyone. I love Nick Sparks’ book, and I totally love how they transition to movies. Why the change to the website? I loved how you did forms before. Jesse — I thought the rafflecopter form might be easier for people, but i am getting a lot of negative feedback. This is the first time i have tried it on my own. SIGH…. I’ve wanted to read this book since I heard about it! Thanks for the chance to win:) Love his books! I love Nicholas Sparks. My fav is Message in a Bottle. This one looks good, definately want to read book first. I am a Nicholas Sparks fan. Thank you for the chance to win this book. This sounds like another great Nicholas Sparks’ book! I have added it to my TBR…I can’t wait to read it 🙂 Thanks for a chance to win!!!! Any book by Sparks makes a wonderful giveaway. Thanks so much! Happy New Year!! Nicholas Spark’s The Last Song is one of my favorite books! I also read A Bend in the Road, Dear John and A Walk to Remember. I would love to read Safe Haven. Jan 6th entry – thanks! I think this one sounds really good! Thanks for the giveaway! Jan 7th entry – thanks! Thanks! i’m a huge fan of Nicholas Sparks’ books! Jan 9th entry – thanks! I love Nicholas Sparks! Thanks for this giveaway!! 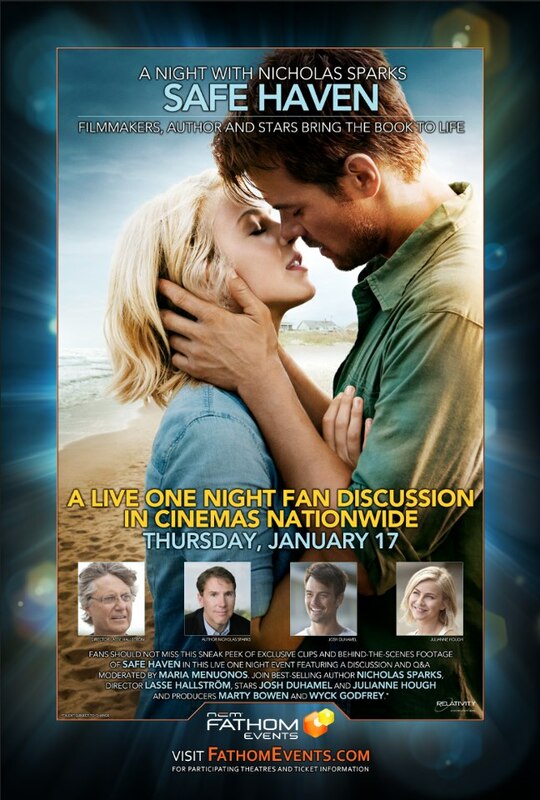 This looks like another great movie and book by the great Nicholas Sparks! Jan 10th entry – thanks! Nicolas Sparks writes thought-provoking stories in books I enjoy seeing where the pages will take me. They character development is well-rounded and plot line is straight forward and easy to follow. I know what to expect from this writer. Jan 11th entry – thanks! Jan 12th entry – thanks! I would love to finally read one of Nicholas Sparks novels! I have been wanting to read this, especially before the movie comes out. Thank you for the giveaway! Jan 13th entry – thanks! Jan 14th entry – thanks! Jan 15th entry – thanks! Jan 16th entry – thanks! Jan 17th entry – thanks! Love his books….”The Wedding” is absolutely enchanting.